Welcome home to this amazing Monte Sereno Estate property located on a quiet cul de sac with a private 400ft gated driveway leading to this fantastic home with approx. 1 Acre lot! This lot is one of the most desired in the area given its secluded privacy and amazing views onto the trickling stream below and the peaceful tree lined rolling hills and distant Mountains that create a very tranquil place to call home! This home offers an open floor plan with 4 bedrooms,3 baths and a large family/Bonus room with wet bar and Sub Zero fridge and with tons of outdoor space and decks to relax or entertain. You just don't get any better than this! Wood floors,entertainers kitchen with built in Sub Zero and Heartland Classic range, solar panels(owned),skylights and solar tubes, granite counter tops, custom cabinetry, crown molding throughout, ample recessed lighting, 2 fireplaces all make this a must see residence! This property is well maintained and move in ready. Owners also have paid for and have plans for expansion (already approved by city) that can be provided as well. 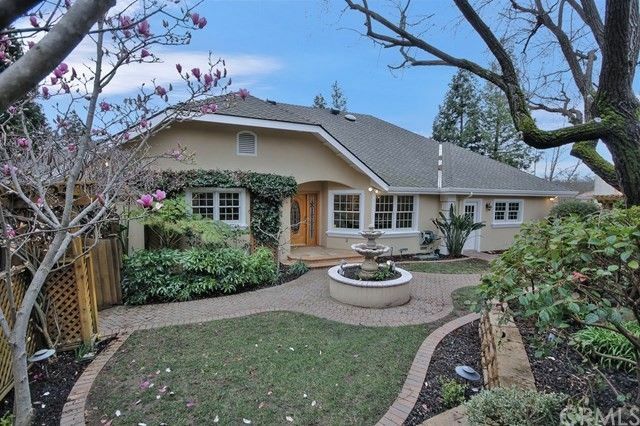 This home is truly a special property and terrific opportunity to own a coveted prime, private and exclusive view lot in the highly desired Monte Sereno Estates section!Be sure to click on video link icon under main photo for an amazing home tour!